Capital Sound has been appointed the audio supplier for the Main Stage at the AEG-Barclaycard British Summer Time Concerts in London’s Hyde Park. Taking place between 5 and 14 July, two headline shows by the Rolling Stones and one by Bon Jovi have already been confirmed, with further high profile acts to be announced. "We are very pleased to have been asked by AEG to provide the sound for the Hyde Park main stage, utilising the Martin Audio MLA system and DiGiCo consoles," says Capital Sound project manager Martin Connolly. "Following extensive listening tests, the system was chosen thanks to its exceptional controllability and audio quality. We know it will perform extremely well and are really looking forward to the shows." 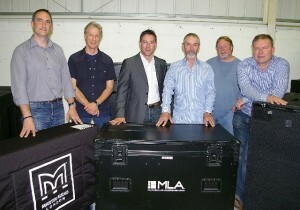 In picture: senior personnel from Martin Audio and Capital Sound, with part of the new MLA system. 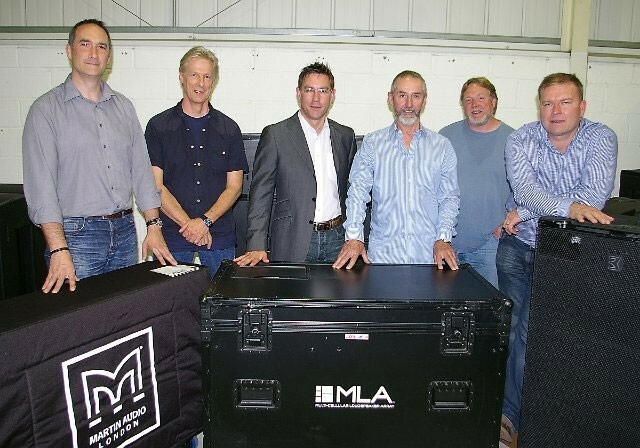 Simon Bull (Martin Audio), Martin Connolly (Capital Sound), Anthony Taylor (Martin Audio), Keith Davis, Ian Colville and Paul Timmins (Capital Sound).